Wire literature and get a move-on with information! 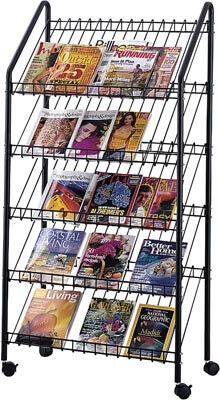 The mobile literature rack is an ideal way to display brochures, pamphlets, resources and magazines. Constructed of welded wire with a powder coat finish. The slant wire shelves allow unlimited display options. Extra tall shelves will easily accommodate over-sized publications. Change up your space and move information where It's needed. The literature display is easily mobile on four dual wheel casters (2 locking).